Supporting the well-being of Ohio’s families and children with challenges, disabilities, and health care needs. Search for toolkits, guides, organizations and events by county or region of Ohio, age range, condition, services, or topic area of interest. Find seminars, support groups, information fairs, workshops, and recreational/social activities in your area of interest and location. Our continually growing collection of guides provides information and resources on topics including care coordination, advocacy, parenting, social services, and more. View and link to all of our resources by location, or filter to find ones to suit your needs. Submit your organization or event information for a free listing (if qualifying) or share your story for an opportunity to be featured on our site! 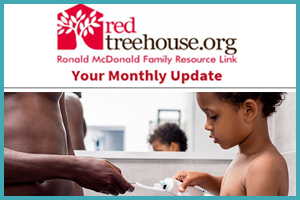 Membership is not required to use RedTreehouse.org, but those who sign up are able to receive our free monthly e-newsletter with information about new content and events. Create your free account today!